There are three popular ways to fold a fitted sheet. Each technique works with the fitted corners to keep them from being bulky. By using these techniques, you can fold a fitted sheet so that it can be stacked neatly with flat sheets in a linen closet or drawer. You will need a flat surface such as a table, bed or countertop for this technique. This is one of the easiest and fastest ways to fold a fitted sheet. Spread the sheet onto a flat surface so it's longer than it is wide. Make sure that the sheet isn't bunched up. Fold the sheet in half lengthwise by bringing the two bottom corners evenly to the top fitted corners. This will give you a long narrow shape. Tuck the fitted corners together so that they form single cupped corners by pushing your hand into the bottom corner and tucking it into the top. The video demonstrates this technique. The top and bottom corners on each end are now neatly tucked inside each other. Take one end of the sheet and fold it to the other end, so the two corners you tucked are together. The sheet will be folded in half. Tuck the four corners together so that they form a cupped shape the same way you did with the first fold. This will form one fitted corner with all four corners neatly tucked into each other. Smooth out the corner so that the sheet now has a squarish shape. Take the end with the fitted corners and fold in thirds. This will completely hide the fitted corners and create a long narrow folded sheet. Start with the "bulky" end of the sheet where the fitted corners are. Fold the sheet in thirds or fourths, depending on the size of your sheet. Notice that the fitted corners are no longer visible and the sheet has the same appearance as that of a folded flat sheet. If you're folding clothes directly from the dryer or a laundry basket, this technique doesn't require a flat surface until the very end. While similar to the first technique, most of the technique is done while standing. In a standing position, hold the sheet so that the wrong side is facing away from you. Grasp the opposite corners of the long side. Insert each hand into these fitted corners. You want to fold the sheet by bringing one hand over the other so that the two are now cupped over one hand. With your free hand, slide it down the hanging portion of the sheet and pick up the next free corner. Tuck this third corner inside the first two corners so that they cover it. Using your free hand, grasp the remaining corner and tuck it inside the other three corners. Straighten the edges and set the sheet on a flat surface. Fold the sheet lengthwise in thirds. This will neatly fold the sheet so that the fitted ends aren't visible. Fold the sheet in thirds or fourths depending on sheet size. This technique is simple and doesn't require corner-to-corner maneuvering. Lay the fitted sheet onto a table or flat surface with the elasticized edges facing up. The sheet will have an oval look due to the fitted corners. Fold the sheet over itself horizontally. This means you'll fold the top of the sheet over the bottom end. Take the top corner of the sheet and tuck it inside the bottom corner. Smooth out wrinkles and release any captured air. Tuck in the gathered edge of the sheet to create a clean line along the side of the fold. Repeat step 3 with the remaining corner. Be sure to tuck it inside and smooth out the gather edge as you did in step 4. Fold sheet lengthwise and smooth out corners. Once more insert top corner into the bottom corner and repeat with the remaining corner. Fold sheet in half and if desired, fold once more. There are a few hints that will help you make the process of folding a fitted sheet easier. Be sure that you continually smooth out the sheet between each fold to release any captured air and eliminate any wrinkles or bulky shapes. This will ensure that the sheet folds rest flat against each other. A twin sheet will be easier to fold than a king size sheet since there is less material. You want to follow the same sequence of steps for each technique regardless of the sheet size. If you find yourself confused or unable to get the ends tucked in according to the instructions, don't panic. Untangle the sheet and start over, taking each step slowly. It may take you more than one time to learn a technique, but once you do, it'll be easy to recreate the next time you do laundry. It's best to fold sheets as soon as they come out of the dryer since you will have fewer wrinkles and it'll be easier to get the desired results. You may wish to try all three techniques to determine which one works best for you. Any of these techniques gives you a great way to reduce the frustration that often accompanies trying to fold a fitted sheet. 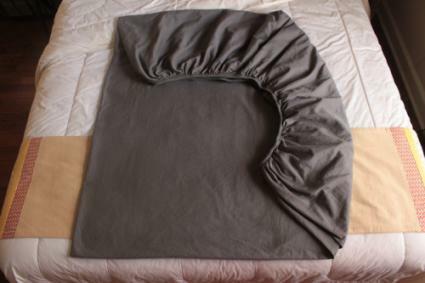 You can see how easy it is to make a fitted sheet suitable for stacking with folded flat sheets by following these techniques.